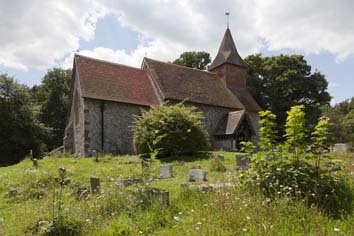 Rebuilt in 1867, copying or re-using some detail from the mainly C13 and C14 old church, including a wooden arcade. Selmeston, like other villages close to the northern side of the Downs, is an early settlement. and a pre-Christian burial was found in the churchyard, which was once roughly circular (Langdon p272). 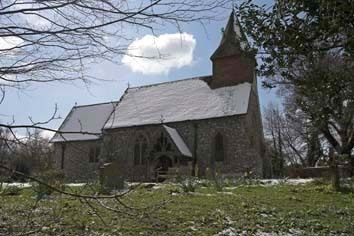 The parish is the only one in the area where the church is mentioned in Domesday Book (10, 53). The present one dates from 1867, but was built on the foundations of its predecessor, as some flintwork near the ground shows. Four sailors took a day to demolish the old church (1 p298) and nothing earlier than the C13 was recognised. A C13 lancet found then is reset in the east wall of the vestry (ibid p299), but its previous location was not recorded. If it came from the chancel, that suggests work was done on it then, as happened in many Sussex churches. The Sharpe Collection drawing of 1803 shows the proportions of the nave would be consistent with an earlier date and the differences from the present one are mostly confined to detail, particularly the windows. The nave was remodelled in the C14 and some features were reused in 1867, like the moulded west doorway and trefoil-headed north west lancet, which has been patched in cement, whilst the three-light west window and trefoiled opening in the gable copy what was there before. So does the tile-hung belfry with a shingled broach spirelet. The panelled tracery of the west window looks late C14, which, on the available evidence, is rather later than the south aisle. The Sharpe drawing shows an east window in the aisle of two close-set trefoiled lights, without a hood. Assuming the latter had not been removed, it looks earlier C14 than the west window, but in Adelaide Tracy’s drawing of 1857 (IV p20) it appears more C15. The present west window of the aisle is square-headed and the form of its predecessor is unknown. 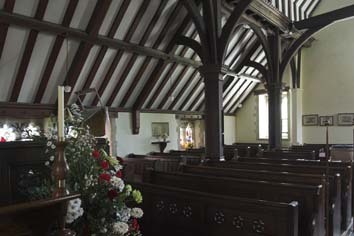 The side-wall of the aisle was, as now, low and though one of the windows in the Sharpe drawing has two lights, there is insufficient detail to date it. The pointed and chamfered chancel arch, shown on an early C19 picture in the church (one of three presented by John Maynard Keynes who was linked with Charleston manor in the parish) also looks C13 or C14. This picture shows two heavy wooden posts in place of an arcade, as today, though they seem proportionately thicker than their replacements. In 1867, they were thought to be late C15 or C16, but as the aisle was C14, that date is more probable. The present posts have castellated capitals, but before 1867 the tops were hidden by plaster (1 p298). Then as now, the posts support the crownpost roof on curved braces and the structure was conceived as one. The Sharpe drawing shows a three-light east window, also without a hood, and a plain south window with a mullion and a transom. Like that of the south aisle, the date is doubtful and the south one is clearly post-Reformation. The church was kept in repair during this period, with the addition of big east buttresses and some at least of the small south windows of the aisle. 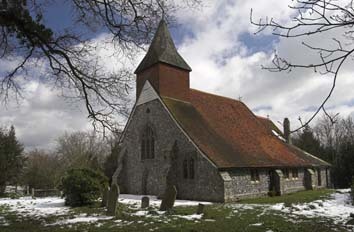 By 1863, however, it was considered unsafe and the vicar W D Parish, a student of Sussex dialects, decided to rebuild it. According to the author of the 1895 article in The Antiquary (1), who had access to Parish, the posts were rotten. The architect of the reconstruction was E Christian (B 25 p788). More of the new detail is C14 in style than before, though as the previous form of the north side is unknown, there may have been precedents for the present wooden porch, open and on a base of flint, and the adjacent window with cusped Y-tracery. The south vestry and east window are entirely by Christian. His reconstruction of the interior is mostly faithful or based on reasonable conjecture, with the exception of the chancel arch, which has shafts and foliage corbels. The wooden lintels of the aisle windows are sufficiently unusual to be almost certainly a reflection of what was there before. There were repairs in 1967-69 by J Schwerdt and Partners, during which the spire received particular attention. The responsible architect was D O Russell (ICBS). Brass: (South aisle floor by pulpit) Henry Rogers (d1639) An inscription, worth noting as he is said to have been for 32 years ‘a painefull preacher in this churche’. 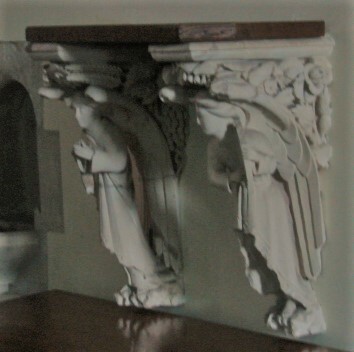 Corbels: (South wall of chancel) Two late C19 angels with something of the sensual spirituality of the later Pre-Raphaelites. It would be interesting to know the sculptor. 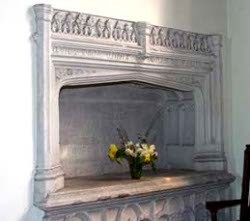 Easter sepulchre: (North chancel) Reset with a depressed head and cresting over; there are quatrefoils bearing various emblems on the front of the chest. It bears an inscription in English in memory of Beatris Bray (d1532) and must date from shortly after her death, as such sepulchres ceased to be used after 1547 at the latest. In fact, Nicholas Antram suggests (BE(E) p625) that the inscription may have replaced the religious scene that was probably originally there, in order to prevent the whole monument being destroyed. Font: Drummond-Roberts (p76) calls it C13, but it is surely C19 or so heavily retooled as to have nothing ancient about it. It resembles that at Cuckfield, West Sussex, with a round bowl with capitals on the curved underside for shafts. 1. 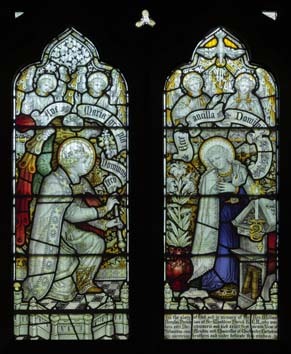 (North chancel window) C E Kempe, 1905, in memory of W D Parish. 2. (Remainder) O’Connor and Sons, 1867 (BE(E) ibid). 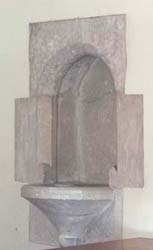 Piscina: (Reset in chancel) The round head is possibly C13; the rest is C19. Reredos: The plain brass panels bearing the Ten Commandments etc on the east wall were by 1867 a conservative feature. They are signed ‘Gawthorp, London’. 1. My thanks to Nick Wiseman for the photographs except that of the bracket. 2. Also to Martin Jones, who spotted the maker’s signature on the reredos.